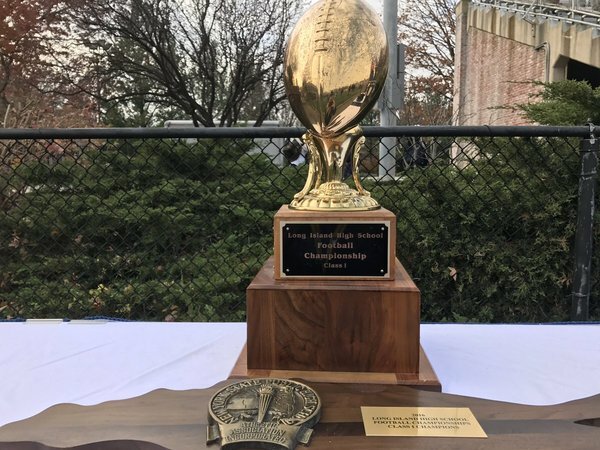 Follow along as MacArthur and Newfield play for the Class II Long Island Championship in football on Friday at 4:30 p.m. at Hofstra. Boxscore will say a 44-yard TD pass from Freeport's Rashad Tucker to Jaelin Hood, but great blocks from Nicolas Olivier & Terrance Edmond. Another 3-and-out for Floyd. Taiani back to punt. Freeport takes over at its own 49 looking to capitalize on good field position. 1st-and-goal for Freeport after the measurement. Ball on the 6-yard line. Aaje Grayson caps a 7-play, 51-yard drive with a 6-yard TD run off right of the offensive line. PAT no good. 13-0, 3:48 to play in the 1st. Nick Silva rips off a huge 48-yard run down the right sideline. Colonials on Freeport's 29. James Taitt runs in from 3 yards out, giving Floyd its first score of this LIC. 13-7, Freeport, with 5 seconds left in the opening quarter. Three is the charm for Floyd. The Colonials scored on their third possession capped by 3-yard TD run by James Taitt as Floyd trails 13-7. Freeport will begin at the 35-yard line after Floyd's short kick is fair-caught by Nicolas Olivier. END OF 1Q: 13-7, Freeport. Speed of the Red Devils has prevailed thus far, but Floyd starting to gain footing on offense. Rashad Tucker drops an absolute dime into the hands of Nicolas Olivier for a 49-yd TD to open the 2nd. Right over the top of the secondary. Freeport calls a timeout before attempting its two-point conversion attempt. Floyd encroachment set up the attempt. Aaje Grayson stiff arms his way into the endzone for the 2-point conversion. 21-7, Freeport. 11:51 remaining in the half. Floyd will begin from the 26-yard line. Freeport winning the field-position game thus far. Check out the TD video my man Owen O'Brien grabbed of this Tucker to Hood pass. Good luck tackling Rashad Tucker without a buddy. He returns the punt 20 yards to Floyd's 40. Rashad Tucker keeps it himself up the middle for a 17-yd TD. 3 plays, 40 yards, 58 seconds. Presprey kick is good. 28-7. Floyd has to find a way to slow down Rashad Tucker & Freeport. The Red Devils have scored on their first four possessions. Floyd starts at its own 31-yard line in need of an answer. Needs to build a sustained drive. Give Floyd credit they continue to move the ball succesfully with that excellent O-Line. They trail 28-7 but they're at the Freeport 9. This Floyd drive is 5:29. Freeport's entire time of possession is 5:32. That's what we like to call explosive. Freeport's Robert Fitzsimmons picks off Taiani in the redzone. Tory Crandall on the pressure. Sophomore Nick Silva is as tough as they come. The Floyd halfback has 85 hard yards but his team trails, 28-7. Quick kick on 3rd down from Freeport catches Floyd off guard, pinning the Colonials inside the 20 at the 15. 1:00 left in the half. END OF HALF: Freeport 28, Floyd 7. Rashad Tucker pretty much doing whatever he wants. Nick Silva running hard for Floyd. Also a 20-yard punt return. Back from halftime. Floyd will kick off to Freeport. Floyd forces a Freeport punt by Tucker, who boots it 32 yards down to Floyd's 23. 7:49 left in the 3rd. Teams trade punts to start the half. Freeport takes over at its own 13. After an explosive first half, that was a scoreless third quarter. 28-7, Freeport. Red Devils 12 minutes from a championship. Freeport has the ball with under 9 minutes to play. Playing a much more conservative game in this second half.